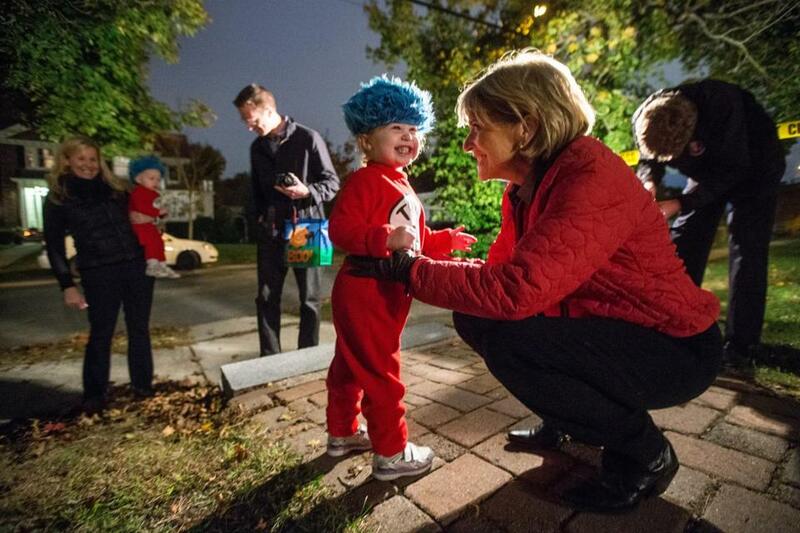 Martha Coakley, right, greeted trick or treater Caroline Thomson-Schwalb, 3, while handing out candy at her home in Medford on Halloween night. With little witches and masked superheroes darting across the street on the spookiest day of the year, Halloween isn’t just scary — it can be dangerous. Children are more than twice as likely to be hit by a car and killed on Halloween than any other day of the year, according to the non-profit Safe Kids Worldwide. “Children are at greater risk of injury than adults because they are small, have trouble judging distances and speeds, and have little to no experience with traffic rules,” the Centers for Disease Control and Prevention wrote in a 2017 article. State and national officials offered the following safety tips to parents. The state Department of Public Health advises to make sure costumes provide clear vision and breathing; that they are flame-resistant and light-colored for visibility; that swords are made of soft materials; and there’s nothing to trip over. The agency also suggested adding reflective tape to children’s bodies and treat bags to make them more visible to drivers. Reflective tape can be found at hardware and sporting goods stores. The National Safety Council reminded parents to make sure costume makeup is nontoxic, and to be sure to take it off before bed. For older children who roam the street for treats with friends, the council suggested planning out a route. Parents could also plan a curfew with older children — who should always travel in groups. The stranger danger rule still applies, the council said. Parents should remind children never to enter the home or car of a stranger. The CDC recommends bringing glow sticks or flashlights so that trick-or-treaters can see and be seen in the dark. Parents should review traffic safety with their mini witches and warlocks before hitting the streets, the agency said. Adults driving on Halloween should remove all distractions including phones, drive slowly, and be prepared to stop. As always, they should practice defensive driving and never drive under the influence. Homeowners should light their doorsteps and walkways, but be sure to keep flames away, the state Department of Public Health said. And only hand out (and accept) wrapped candy or treats; avoid toys that could lead to choking for small children. According to the CDC, nearly one-third of deaths in the fall occur between 6 p.m. and 9 p.m. As the nights grow longer, dangers for pedestrians grow. A spokeswoman for the state Department of Public Health said that Halloween also falls near the close of daylight saving time, which could be a cause of the increase in pedestrian injuries.